Newport captain Joss Labadie scored a bizarre goal at the death to earn a League Two win at Cambridge. Home goalkeeper David Forde's panicked clearance kick rebounded off Labadie's chest and ballooned into the goal. Shawn McCoulsky broke the deadlock as the opening period drew to a close, pouncing on a rebound to score. Cambridge took control after the break and were rewarded as Brown hammered in a left-foot shot to level, but Labadie's winner undid their work. 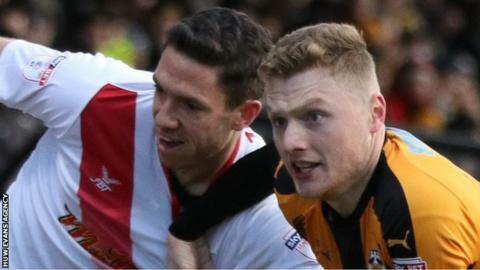 The win sent The Exiles from 12th to ninth in the table, a point off the play-off places while Cambridge stayed 13th. In the process Newport recorded a second win over them in December following the 2-0 FA Cup victory on 3 December, when Labadie scored both goals. Newport boss Mike Flynn told BBC Sport Wales: "I didn't think we were at our best today and fair play to Cambridge, they made it difficult for us - they played some really good football. "But what a nice feeling when you win it at the end having not been at your best. I'm delighted." Match ends, Cambridge United 1, Newport County 2. Second Half ends, Cambridge United 1, Newport County 2. Goal! Cambridge United 1, Newport County 2. Joss Labadie (Newport County) right footed shot from the centre of the box to the centre of the goal following a set piece situation. Joss Labadie (Newport County) wins a free kick in the defensive half. Jake Carroll (Cambridge United) wins a free kick on the right wing. Foul by Joss Labadie (Newport County). Substitution, Newport County. Padraig Amond replaces Shawn McCoulsky. Hand ball by Shawn McCoulsky (Newport County). Joss Labadie (Newport County) is shown the yellow card for a bad foul. Medy Elito (Cambridge United) wins a free kick in the defensive half. Attempt missed. Scot Bennett (Newport County) right footed shot from the centre of the box is too high. Corner, Newport County. Conceded by Greg Taylor. Attempt blocked. Matthew Dolan (Newport County) right footed shot from long range on the left is blocked. Goal! Cambridge United 1, Newport County 1. Jevani Brown (Cambridge United) left footed shot from outside the box to the top left corner. Substitution, Cambridge United. Harrison Dunk replaces Paul Lewis. Attempt saved. Adebayo Azeez (Cambridge United) header from the left side of the six yard box is saved in the centre of the goal. Attempt saved. Paul Lewis (Cambridge United) header from the centre of the box is saved in the top left corner. Frank Nouble (Newport County) is shown the yellow card. Brad Halliday (Cambridge United) wins a free kick on the left wing. Attempt missed. George Taft (Cambridge United) header from the centre of the box is too high following a set piece situation. George Maris (Cambridge United) wins a free kick in the defensive half. Attempt missed. Scot Bennett (Newport County) left footed shot from the centre of the box is just a bit too high. Foul by Shawn McCoulsky (Newport County). Medy Elito (Cambridge United) wins a free kick in the attacking half. Attempt saved. Brad Halliday (Cambridge United) right footed shot from a difficult angle on the right is saved in the bottom right corner. Ben White (Newport County) is shown the yellow card. Attempt missed. Medy Elito (Cambridge United) left footed shot from the left side of the box is just a bit too high. Substitution, Newport County. Robbie Willmott replaces David Pipe. Brad Halliday (Cambridge United) is shown the yellow card for a bad foul. Frank Nouble (Newport County) wins a free kick in the defensive half. Foul by Brad Halliday (Cambridge United). Attempt saved. Medy Elito (Cambridge United) right footed shot from outside the box is saved in the centre of the goal. Delay in match (Newport County).